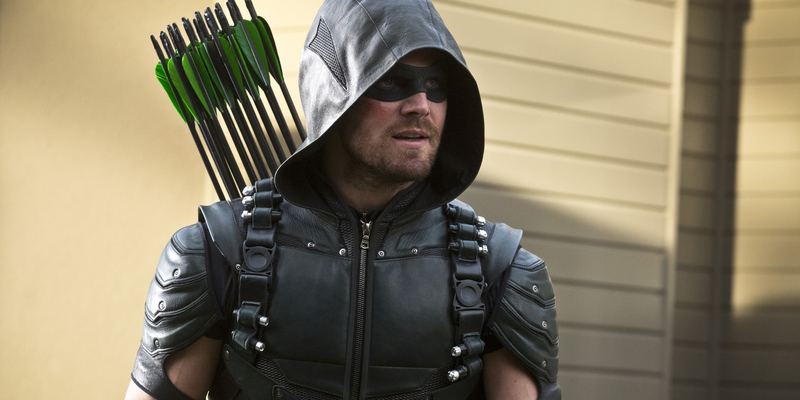 The penultimate episode of Arrow season 4 doesn't lack for action. The hour features a number of frenetic chase and fight scenes interspersed with entire segments dedicated to Felicity, Curtis, and Noah (or the Calculator, if you prefer) typing away at their computers, narrating for the audience and one another what they're doing, being certain to use computer jargon so that it sounds exciting. It's not. But the sequence is given just enough energy from exploding electronics and director Glen Winter circling his actors with the camera that it avoids becoming static. As the hour unfolds, shifting its focus away from Damien Darhk's now godlike status, or the nuclear fallout of last episode, 'Lost in the Flood' becomes a reflection of that scene: there's a lot of action going on and much of it looks fine, but it is surface-level intrigue at best, a late-season stall to shuffle the pieces around until Darhk and Team Arrow can face off. As a series, Arrow has made fractured family drama a major priority since the first episode, so pushing things like the influence of bad fathers on their daughters is the show operating well within its wheelhouse. There is a respectable consistency in the threads the hour sets up, too, as Felicity bonding with her criminal father and learning the truth regarding his departure from Team Smoak – that he didn't abandon his family; Donna ran off with her child as a preventative measure – matches up well with Thea's on-again, off-again relationship with Malcolm. This time, the on-again part comes courtesy of the little yellow mind-control pill that turns Speedy into a temporary adversary for Oliver and Diggle, as they storm the surreal suburban landscape of Hive's brave new world. There is value in Felicity and Noah using their common ground as hackers to salvage something of a relationship with one another; the Calculator is after all another of Arrow's favorite archetypes: the wayward father. It also makes for an interesting exploration of Felicity and Donna's relationship, as Donna's actions reaffirm that hard, proactive choices sometimes have to be made in order to protect those who cannot yet protect themselves. But the show doesn't hold Donna's decision up as entirely good or bad; it instead suggests the choice is a little like Noah himself: a bit of both. And Curtis' assessment of the situation as perhaps too proactive echoes Felicity's choice to end her relationship with Oliver, introducing another wrinkle in the interpersonal relationships of these characters that gives additional weight to not only the family drama, but also Curtis' role on Team Arrow. But the benefits to Felicity's story are undercut by the overall sense of timing and by the obvious plot maneuverings set up by Donna demanding Noah skedaddle once again so that he's not in the loft when Damien shows up to get sweet, sweet revenge on Oliver for Ruvé's death. If one were the betting sort, now would be a good time to put some money down on Noah making a grand gesture against Hive and Darhk before season 4 comes to an end. The transparency of Noah becoming a plot device is only troubling as it further underlines just how incongruous it is to have this sort of interpersonal drama going on while characters are attempting to prevent an even greater nuclear attack from happening. Lets not forget that tens of thousands of people lost their lives last week, and here those lives are hardly mentioned beyond a few cursory news snippets. It's understandable that Arrow wants to raise the stakes of the show, considering the magnitude of the superhero universe it now finds itself a part of, but it can't keep writing off things like Felicity's paralysis, a nuclear bomb wiping out an entire town, and, as seen in the episode's closing moments, a portion of Star City collapsing in on itself, as just "stuff that happens." The emotional throughline of the season feels divorced from these events because of its unwillingness to address their consequences. The audience understands these losses are intended to be tremendous, but there's little to suggest the show can successfully match these plot developments up with the emotional beats of its characters. The same holds true for Damien Darhk. Once a welcome spot of maniacal glee, Darhk has himself been divorced from his own evil machinations, as the attempt to bring about nuclear Armageddon removes Darhk and his powers from the equation, so that Brother Eye can counter-hack Team Arrow's attempt to disable Rubicon. Adding Felicity's old boyfriend to the plot is another obstruction to keep the endgame at bay for just a few more minutes. And this is a real shame as it takes screen time away from Alexander Calvert's (Anarky) attempt to outdo Neal McDonough's delightful over-the-top routine he's delivered all season long. Both actors' exaggerated villainy make for entertaining disruptions, especially when Calvert inverts the father-daughter theme by referring to Thea as his mother, and later when Darhk promises to create hell on earth after learning of his wife's death. In the end, 'Lost in the Flood' itself feels lost in the flood of table setting and mistimed character beats propelling Arrow to the end of its fourth season. Still, the showdown between Darhk and Team Arrow is at last positioned front and center, which with any luck means the finale will resolve the feeling of disconnect between what the main villain was intended to represent and Oliver's actions to counteract them on a character level.